Montreal Canadiens: Could Brendan Gallagher Dominate in 2018-19? Could Gallagher Dominate in 2018-19? The Montreal Canadiens were able to see the real Brendan Gallagher return in 2017-18. After two consecutive years of serious hand injuries, the speedy winger had his best season, scoring a career-high 31 goals and 54 points. A healthy Gallagher played in all 82 games in the style the Habs are accustomed to, digging pucks out of corners, driving towards the net, and playing solid positional hockey. Most fans saw a significant change in his attitude as well. Known for a take-no-prisoners style around opposing goaltenders, he earned the wrath of many referees and officials over the years. This year he was more subdued, arguing less, and demonstrating the maturity of a player more interested in being a playmaker than a pest. For the coming year, the big question will be how far he can continue to improve offensively. The first factor will be his health, but the second will also be crucial to the overall success of the team. 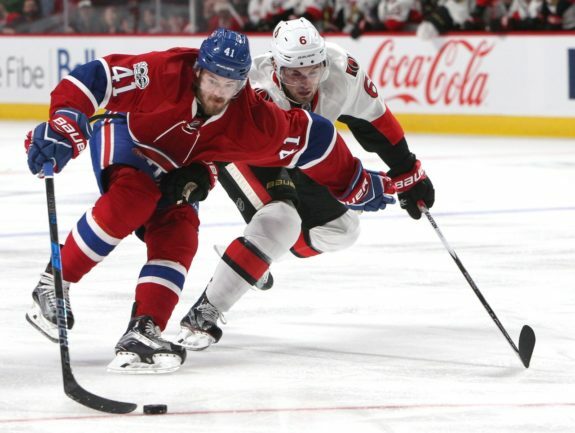 The Habs must make key roster moves to compete for a playoff position. Changes will likely be made to the top two lines and any improvement will be felt in Gallagher’s output immediately. If you look closely at his statistics, Gallagher’s performance in 2017-18 was more impressive given the amount of time he spent as an offensive zone forward. With his duties split between generating offense and shutting down the opponents’ top lines, he frequently played with less adept playmakers and often had to generate chances himself. His most common linemates were Tomas Plekanec and Paul Byron, followed by Charles Hudon and Jonathan Drouin. Hudon was in his first full season as a regular, while Drouin spent much of the year adapting to his new position. If we are to believe management, Drouin is still a possible top-six centre. The team will have to commit to this and use him at that position exclusively next year. If that happens, there’s hope the impact of new assistant coach Dominque Ducharme will aid his progress. Ducharme not only coached Drouin at centre with the Halifax Mooseheads, he was also responsible for the development of the Colorado Avalanche superstar centre, Nathan MacKinnon. Unless they decide to draft Brady Tkachuk, the Habs will have to sign a centre through free agency or a trade. I still predict they’ll make an offer to Paul Stastny, but should that fall through, another playmaking centre isn’t just a luxury, it’s a necessity. 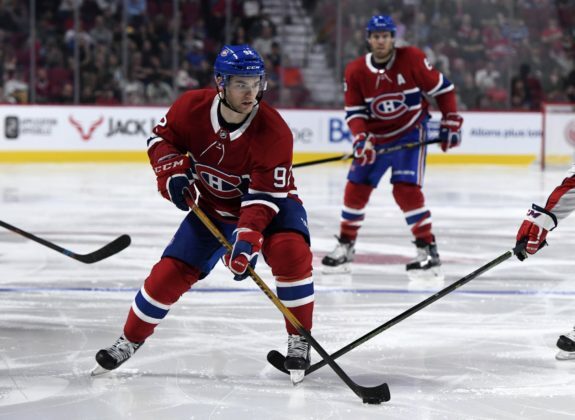 Despite his weak offensive numbers, losing Plekanec leaves a huge hole in the lineup that Phillip Danault or Jacob de la Rose would struggle to fill. If Marc Bergevin fails to address this, the Habs will be juggling lines with numerous combinations that won’t bode well for Gallagher’s stats. The team also needs a puck-moving defenseman who can make an accurate pass out of the zone at even strength, but with the continued maturity of Victor Mete and Noah Juulsen, they may not need to look outside of the organization. 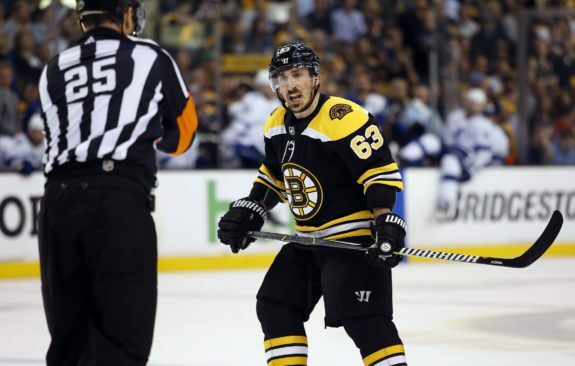 Can Gallagher Match Brad Marchand’s Numbers? Over the course of their careers, more than a few comparisons have been made between Gallagher and Boston Bruins forward Brad Marchand. Both men are small in stature but play with the aggression of larger forwards. Both are offensive-minded and rarely give up on a play. Both are also known for their chippy attitude, although Marchand has taken it to a new level with several suspensions under his belt. When it comes to statistics, the numbers favour Marchand, until we examine their careers more closely. At 30, Marchand is four years older than Gallagher and also turned professional four years earlier. In 2014-15, his sixth NHL season, he scored 24 goals and 18 assists. At that point, the 27-year-old Marchand’s career totals stood at 377 games played, 116 goals, and 112 assists. By comparison, the 26-year-old Gallagher’s numbers (406 games played, 118 goals, 121 assists) match up well, especially when you consider the hand injuries that limited his effectiveness at shooting and holding his stick after his return to action. In 2015-16, Marchand exploded for 37 goals, playing with more confidence while increasing his puck possession time and maturing as a playmaker. His value to the Bruins became so important that he was considered a possible candidate for the Hart Trophy. Over the next two seasons, Marchand became one of the league’s top scorers, limited only by his inability to stay away from the NHL Department of Player Safety. He also continued to be a solid two-way player, contributing more than his share of minutes killing penalties. As he heads into his seventh year, can Gallagher match this success? With the momentum from last season, expect a fast start from Gallagher in the coming year. A key to his performance will be the chemistry he develops with his linemates, especially any new faces on the team. Claude Julien will try out several line combinations during the exhibition season, but he’s likely to have Gallagher on the same line as Paul Byron once again. The two forwards play a similar style, using their speed and aggressive forechecking ability to generate chances in the offensive zone. They also have a strong work ethic that was often missing from the rest of the team last season. Barring an additional move up front, expect Drouin to continue centring the two wingers. The Canadiens have to find another centre to work with Max Pacioretty on the first line, as he relies heavily on other playmakers for his success. Drouin’s speed is a natural match for Byron and Gallagher, but he must continue to improve in the faceoff circle and work on his defensive play to create opportunities at the other end of the ice. With solid linemates and help up front, a healthy Gallagher should crack the 65-point plateau next year. While I don’t expect him to hit the 40-goal mark, he can easily add a few extra tallies to his total from last season, as an improved Drouin or a solid acquisition will place more pucks near the net. Two things are sure bets: Gallagher’s self-confidence will be high and his conditioning, with his father Ian as his trainer, will be top notch. He may not immediately match the output of Marchand, but as he enters his prime, his totals could soon be worthy of comparison.